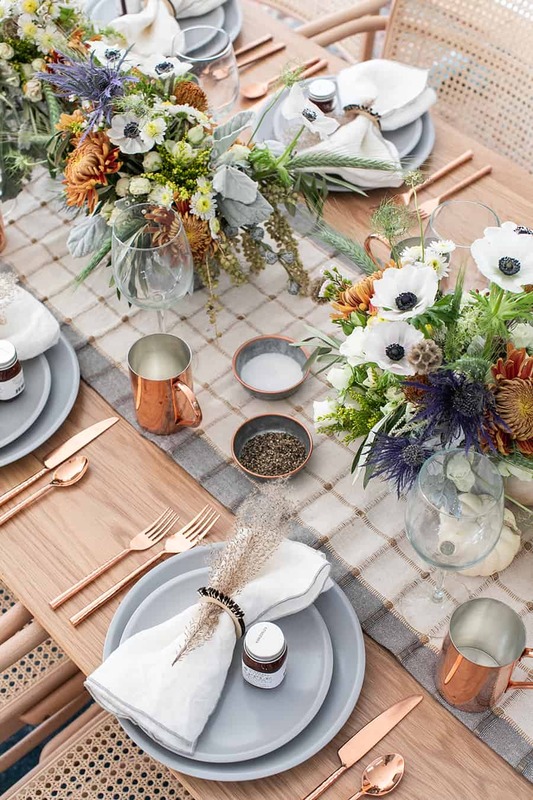 Ideas for setting your own rustic, modern Thanksgiving table setting with a charming touch of modern elements. Thanksgiving is upon us! 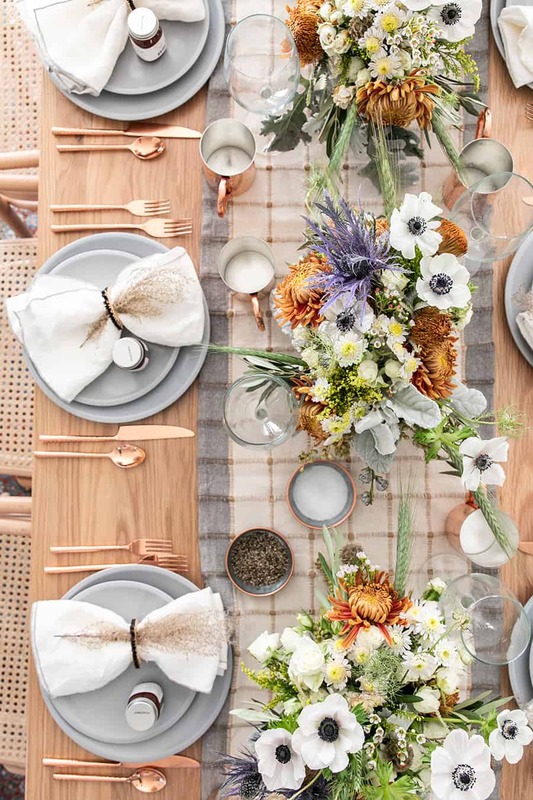 If there is one holiday to set a beautiful table for, it’s Thanksgiving!! This year we’ve added in galvanized metal touches and mixed in some copper too. 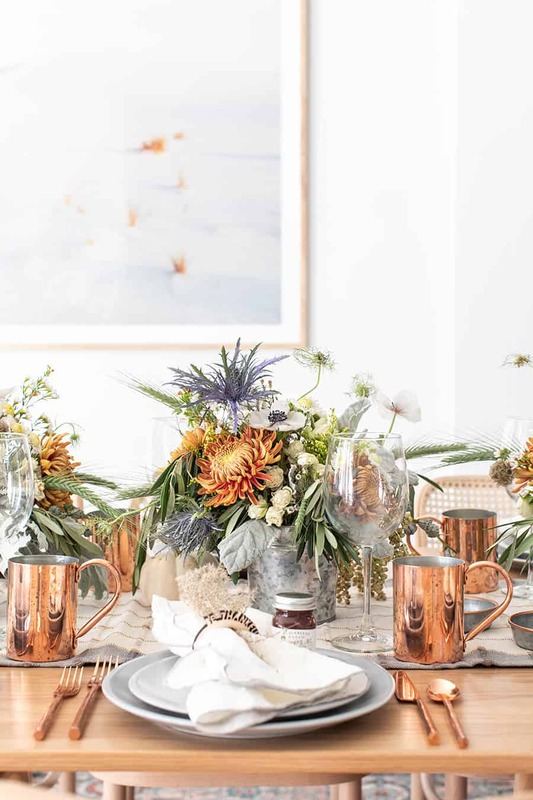 I was inspired by a decor piece I saw that used both metals and thought it would look stunning on a fall table setting! I also wanted to use my beautiful Le Creuset Matte dinnerware in Heather Grey, so I went with a blue, gray and copper color design. 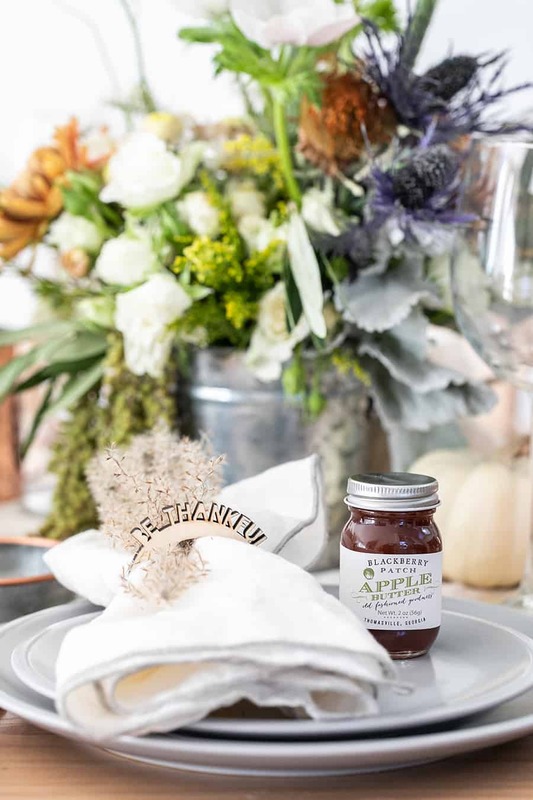 Below you’ll find our Sugar and Charm shopping guide for the items on this table. 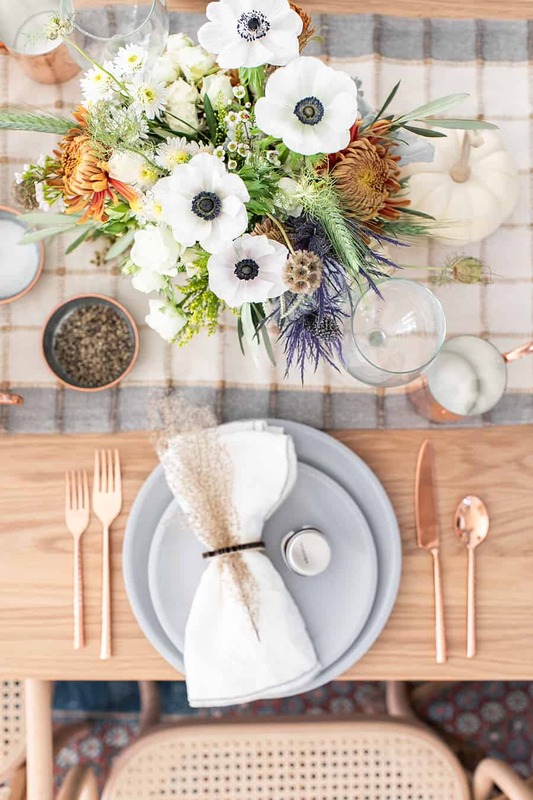 Also, if you need help setting your Thanksgiving table, here is our Charming Modern Tablesetting Guide. 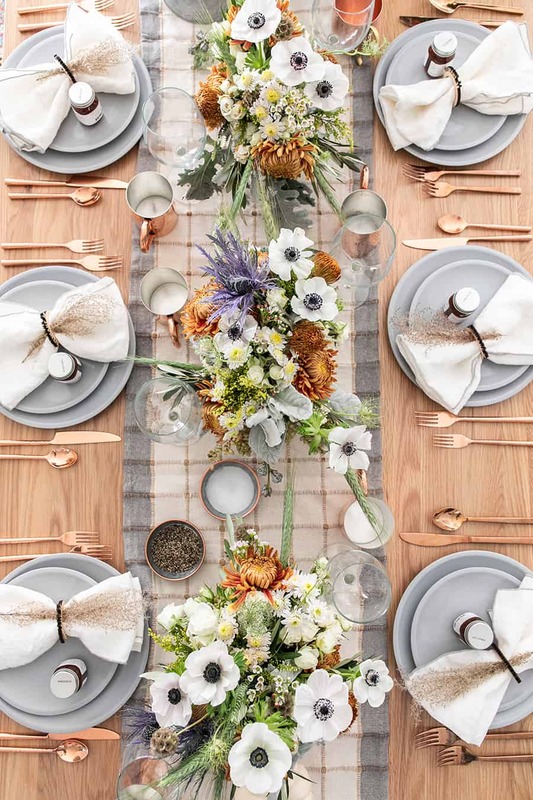 And you can see last year’s Thanksgiving table here, still one of my favorites! 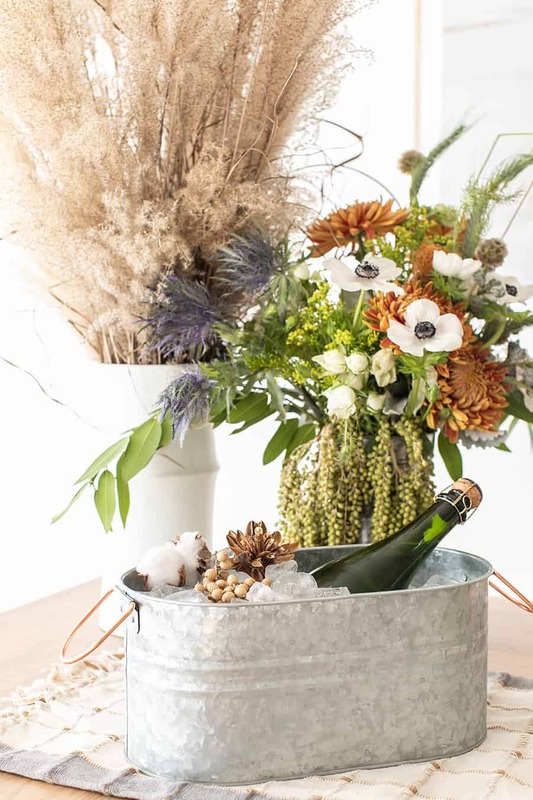 The flower arrangements were made in galvanized buckets, which added a little rustic charm to the table. They’re also really affordable and can be used for so many different things! 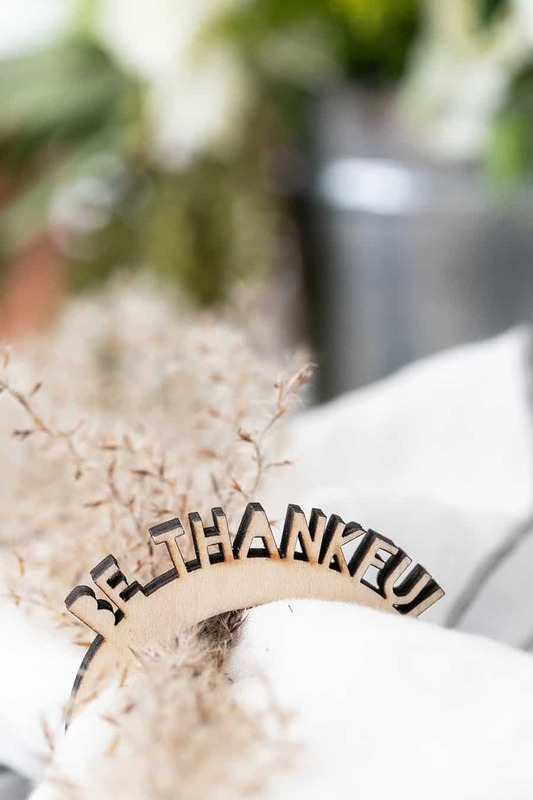 The Be Thankful napkin rings were perfect for this Thanksgiving table setting. 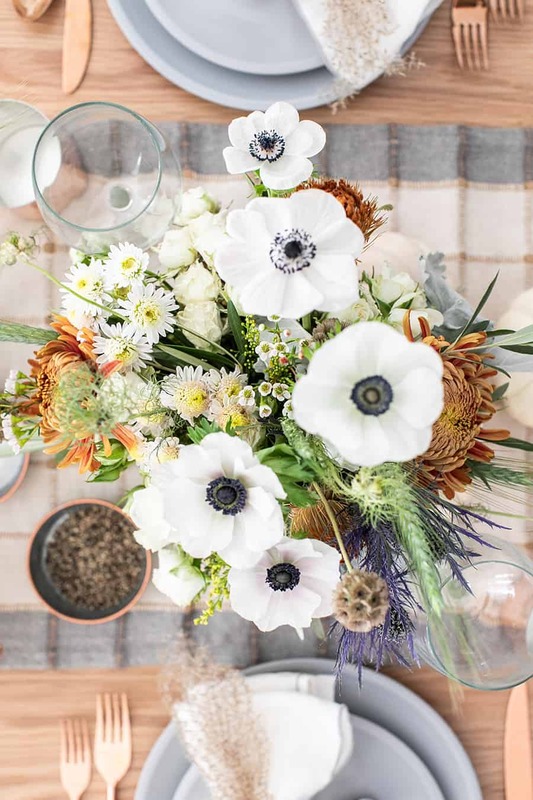 It’s the small details that make the table feel complete and cohesive. 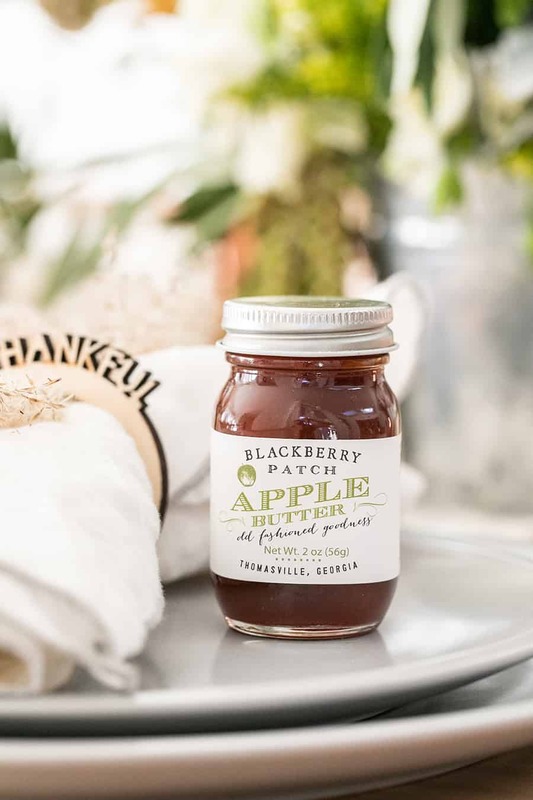 I placed a mini apple butter on each table setting. They can be used on biscuits or even on the turkey! 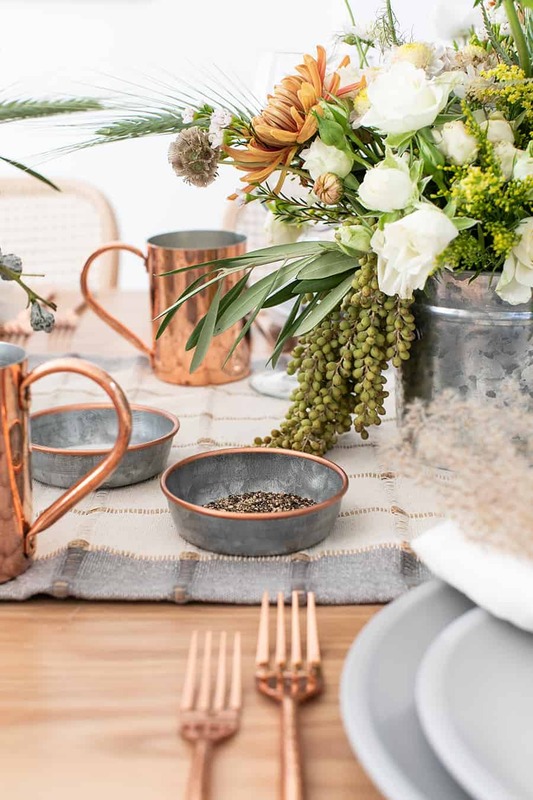 I love the look of copper mugs on the table. 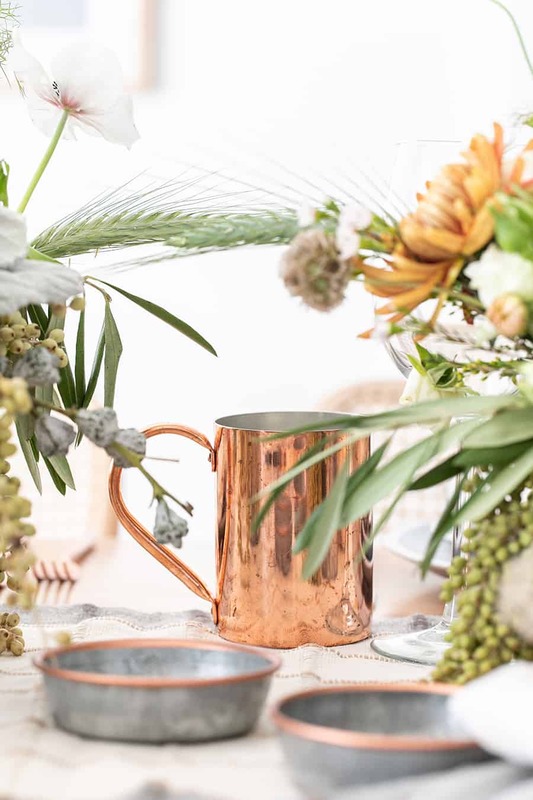 They’re also perfect for serving Apple Cider Moscow Mules! 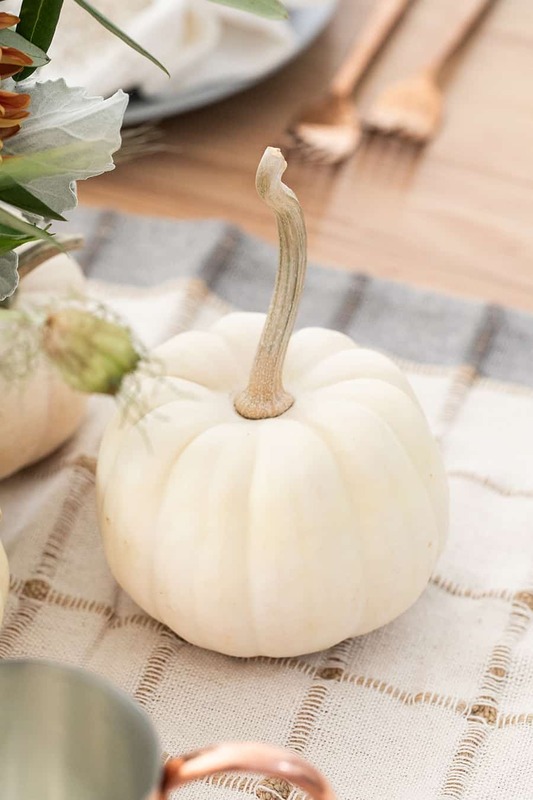 I love the look of white pumpkins lining the table. You can find them at your local grocery store this time of year. 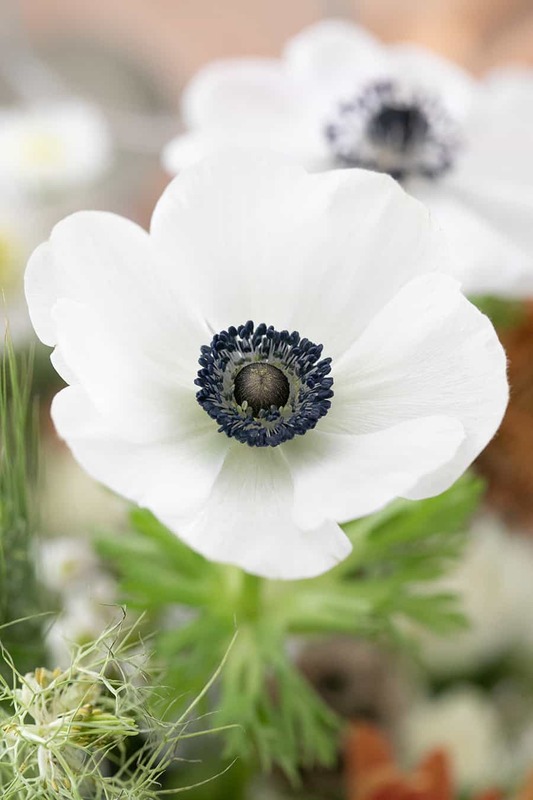 Get ones with cool stems if you see any! 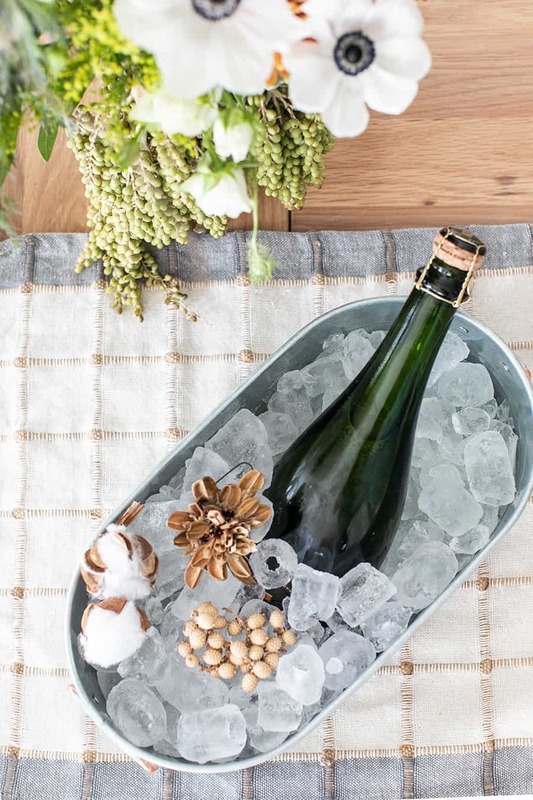 It adds more character and texture to the table.